"Someone always has to carry the pain, now it's your turn…" Sony has revealed the second trailer for the next film in David Fincher's English-language version of The Girl in the Dragon Tattoo series, continuing with the sequel The Girl in the Spider's Web. This time, Uruguayan filmmaker Fede Alvarez (of the Evil Dead remake) is directing and they're going in what seems to be a bit of a new direction - with a more action-heavy psychological thriller vibe. The Girl in the Spider's Web stars Claire Foy as the new Lisbeth, hacker extraordinaire, and Swedish actor Sverrir Gudnason as her cohort Mikael Blomkvist. The full cast includes Sylvia Hoeks, Lakeith Stanfield, Stephen Merchant, Vicky Krieps, Cameron Britton, and Claes Bang from The Square. This trailer definitely has more action, including motorcycle chases and snipers, which seems a bit excessive for this crime thriller but so be it. Maybe this will turn out pretty good? You can watch the first official trailer for The Girl in the Spider's Web here, to see the original teaser again. Young computer hacker Lisbeth Salander and journalist Mikael Blomkvist find themselves caught in a web of spies, cybercriminals and corrupt government officials. Lisbeth Salander, the cult figure and title character of the acclaimed Millennium book series created by Stieg Larsson, will return to the screen in The Girl in the Spider’s Web, a first-time adaptation of the recent global bestseller. 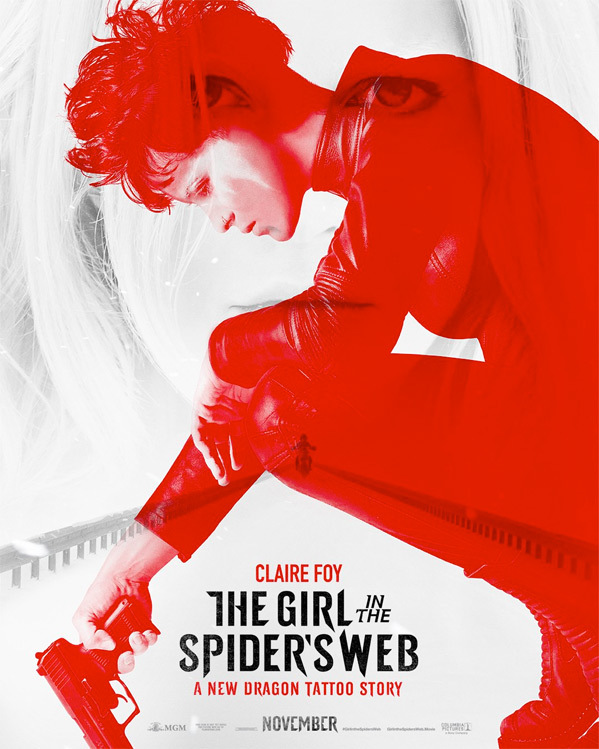 The Girl in the Spider's Web is directed by Uruguayan filmmaker Fede Alvarez, director of the films Evil Dead and Don't Breathe previously, as well as a number of shorts. The screenplay is written by Fede Alvarez, Jay Basu, and Steven Knight. Adapted from the book of the same name written by David Lagercrantz, the sequel to Stieg Larsson's original Dragon Tattoo book series. Sony Pictures will release Fede Alvarez's The Girl in the Spider's Web in theaters everywhere starting on November 9th later this fall. Looking better? Who's going to watch this?